High Road Riders Host ASMI Classes in Illinois | Hupy and Abraham, S.C. 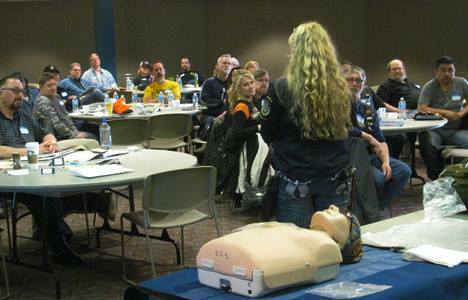 The High Road Riders of Willow Creek Community Church hosted three days of Accident Scene Management training, April 4-6, 2014. Willow Creek Church is located in South Barrington, Illinois and is home to the High Road Riders. 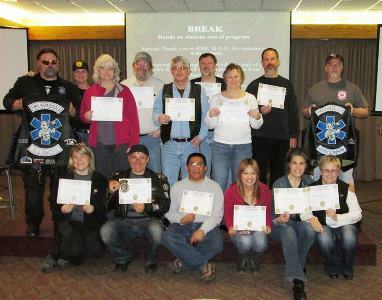 This group of motorcyclists meets every Sunday at 9am at the church for a workshop service. The group also encourages its members to get trained in Accident Scene Management (ASM). On Friday, April 4th, ASM Founder Vicki Sanfelipo and lead instructor Tony Sanfelipo conducted an ASM refresher class which is suggested training every two years. On Saturday, the pair taught the ASM Basic class to a large group of mostly High Road Riders members. 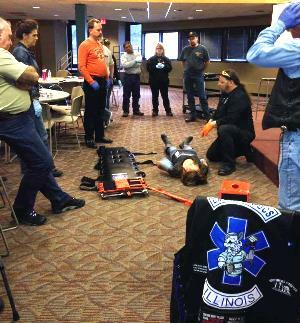 ASM teaches motorcyclists what to do in the event of a motorcycle crash until professional help arrives. The training has served the High Road Riders well as trained members have responded at several crash scenes and were a positive and calming influence at the scenes. On Sunday, EMS Roaddocs founder Bill Benson and Lead Instructor Larry Gray continued the training with ASM Advanced training, which teaches students to assist emergency services when it arrives and also some medical issues beyond the trauma scope of the basic class. ASM has been visiting and training at Willow Creek Community Church for the High Road Riders for ten years. High Road Riders are an asset to their community and should be commended for providing this training for their members. On April 26, High Road Riders presents its Annual Bike Blessing, starting at Willow Creek Community Church and ending at Woodstock Harley-Davidson. The ride is open to the public and is a fun way to start the riding season for 2014.